COMING SOON 5217 Kentwood Drive, McKinney, Texas located in the Retreat at Craig Ranch. Gorgeous low maintenance home located in the Retreat and Craig Ranch on a corner lot. Under Contract - Wynn Ridge Estates Village in Mckinney, Texas. If you're looking to sell or purchase a new home Luxe Realty Group would love to assist you!A Luxury Experience At Any Price! 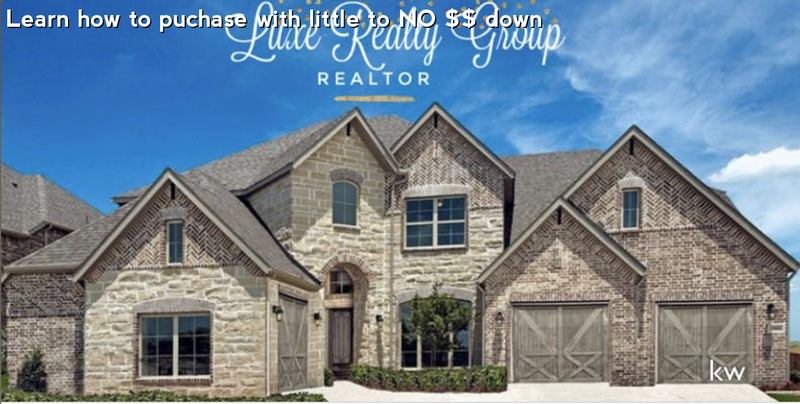 UNDER CONTRACT - 3505 Cheyenne Trail, Garland, Texas If you are looking to sell or purchase a new home Luxe Realty Group would love to assist you! A Luxury Experience At Any Price Point! PENDING - 11556 Seaside Lane Frisco, Texas If you are interested in selling or purchasing Luxe Realty Group would love to assist you! We offer a Luxury Experience at Any Price Point! Check out the Newest Additions to the McKinney Dining Scene!! !COMING SOON! 1. Uncork'd Bar & Grill Now open for Lunch, Brunch and Dinner! Located at 301 N. Custer Rd Suite 190, McKinney. Thank you to the Robinson's for trusting Luxe Realty Group with your Real Estate needs. Sold - 5104 Dunster Drive, McKinney, Texas 75070 A Luxury Experience At Any Price Point! Coming soon! Melissa, Texas Country living only minutes away from Mckinney-Allen-Plano! Corner lot sitting on 1.03 acres. A Luxury Experience At Any Price Point! Tips To Get Settled In A New HomeMoving into a new home? We know how exciting it can be! We’ve compiled a list of a few things you can do after your move to make sure your experience is. JUST LISTED - If you are looking for a Luxury Experience At Any Price Point we would love to help you sell your home or purchase your dream home. You can reach us at 469-712-4888. COMING SOON!! Garland,Texas! If you are looking for a Luxury Experience At Any Price Point we would love to help you sell your home or purchase your dream home. 469-712-4888. When signing documents for a home sale or purchase, the numbers are figured to the penny and the signatures are scrutinized to the letter. Quite a volume and variety of paperwork is involved. SOLD! Beautiful Highland Home in Argyle, Texas! Thank you Godfrey's for trusting Luxe Realty Group help you and your family find your dream home! A Luxury Experience At Any Price! UNDER CONTRACT! Beautiful Highland home in Argyle, Texas ! Do you know anyone interested in purchasing a new build? Our job is to negotiate for YOU even on new builds!A Luxury Experience At Any! Take a peek at the latest market statistics for North of Dallas. New listings are up 8.4% with 6.3% increase in closed sales and 4.3% change in median sales price making it $319,686. Gorgeous home offers 3 bedrooms, a study with a closet, located in desirable location in Vickery Place (M-Streets boundary) Easy access to 75 and close proximity to Knox-Henderson shops and. About McKinney, TexasThe elements that established McKinney as unique from its very beginnings are the same that continue to attract residents, visitors and businesses to our community today. Take a tour of this luxurious home in Dallas, TX. Act now because this jewel will not last. WHY YOU NEED TO SELL THIS SUMMERThe market is hot, hot, hot! With interest rates at an all time low for buyers, the market has turned into a feeding frenzy, and home sales are skyrocketing in. Just listed in Dallas. Great starter or investment home 3/2 for $120,000! Call for a private showing before its! Beautiful Move in ready brick home complete with charming corner fireplace & vaulted ceilings! Open layout with great natural light! Master suite features separate shower with his & her sinks! Join us for an open house to check out this amazing listing before it's! Massive home to enjoy all the luxuries of a large but affordable home. Grand staircase leads to loft, media room, 4 bedrooms. Downstairs features large master suite and guest bedroom-bathroom. Click here to find out what your home is. Join us this Mother's Day for an open house at 5771 Chamberlyne Dr in Frisco, Texas. This gem is rare opportunity--Back on the! Contact me for a private tour of this home in the exclusive Starwood Community located in Frisco, Texas nearby the new Billion Dollar ($5.4 billion to be exact) and the Cowboys Headquarters. Like many other transplants moving from across the country and even the world to the Dallas/Ft. Worth area, I was excited to make this my new hometown. Here's a snippet of my experiences.